Beach naupuka, photographed at Atlantic Dunes Park, Delray Beach, Palm Beach County, in September 2016. Looks innocent enough, but this is an evil twin, an invasive plant that is taking vital dune habitat from an endangered native that looks nearly identical. 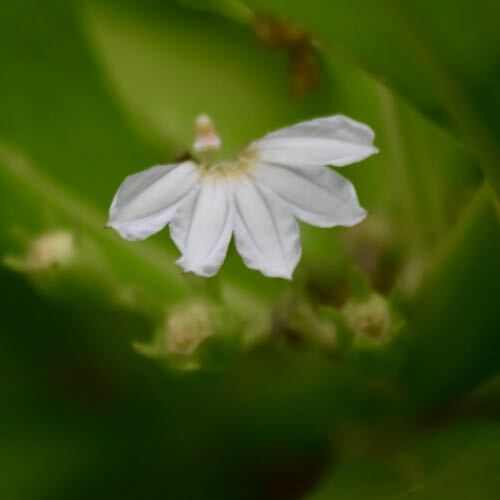 Beach naupaka, Scaevola taccada, is actually an extremely important plant within its native range, which includes Hawaii. There are actually myths told about the plant. In fact, it's named after a beautiful, legendary Hawaiian princess. But here in Florida, it's an invasive menace, threating the existence of a native plant variously known as inkberry, gallberry or gullfeed. Scientifically, it known as Scaevola plumieri. Note the genus name is the same of beach naupaka. The two plants grow in the same beach habitats and closely resemble each other. 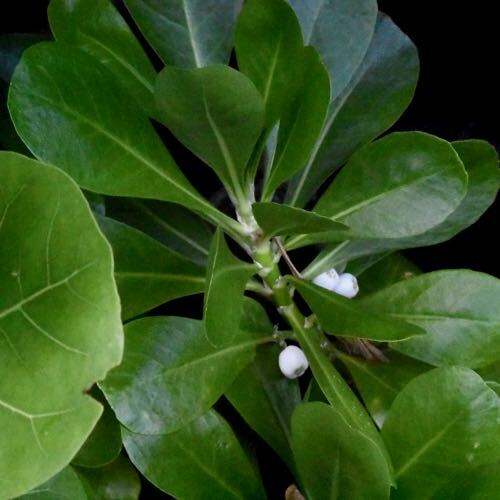 The one major difference: beach naupaka has white berries, inkberry has dark..
Beach naupaka was introduced in Florida during the 1960s and '70s and widely promoted for use in beach stabilization projects. It since has escaped cultivated landscapes and found its way into coastal dunes, rock barrens, hammocks and other natural places. Despite its status as an invasive by the Florida Exotic Pest Plant Council, it's still sold on the market. 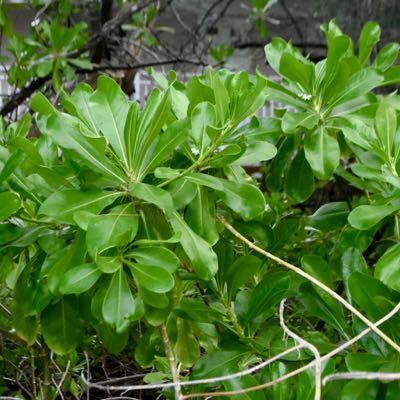 Some nurseries, intentionally or not, have marketed beach naupaka as the native inkberry, according to the Florida Fish and Wildlife Conservation Commission. 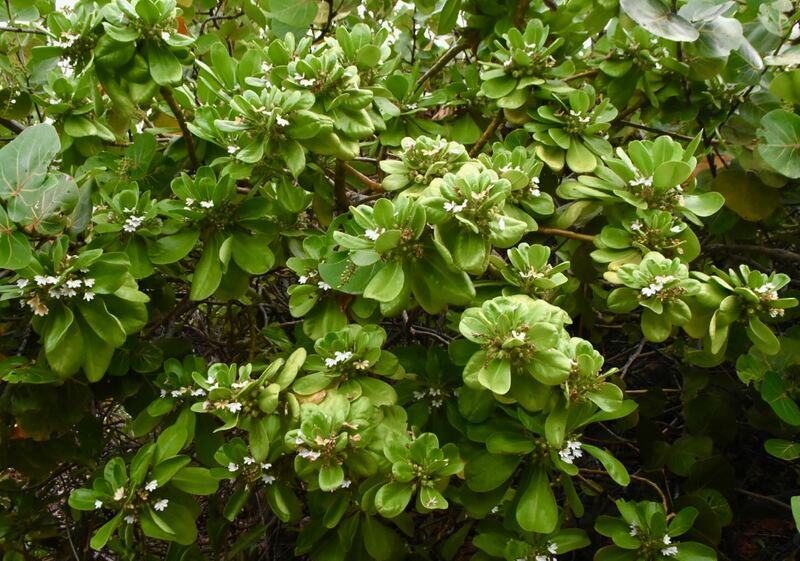 Beach naupaka is a perennial shrub native to warmer parts of the Pacific and Indian ocean basins, including Asia, Africa, Australia and the Pacific Islands. In Florida, it's found in coastal areas as far north as Brevard and Volusia counties along the Atlantic and Tampa Bay on the Gulf. It is frost sensitive, so cold weather limits its range. Beach naupaka is a large shrub, growing to 10 tall or more, with a spread of about 15 feet. Leaves tend to cluster at the end of branches, making the plant somewhat open in its interior. The leaves are vaguely shaped like a club or baseball bat, with a wavey or ruffled appearance and blunt on the end. It grows much faster than its native twin. The most notable thing about beach naupuka's appearance is the flowers. They 're generally white, sometimes tinged pink or violet, with five petals arranged almost fan-shaped, fused together at the base. The effect is that it looks like only half a flower. In fact, that's one of its common names: half flower. In Hawaii, there's a story about how it got that way. Inkberry has the same kind of flower, but overall the plant is smaller and the leaves are smaller than beach naupaka. It's also less dense, and somewhat more cold tolerant. But the easiest tell between the two is the berry. Beach naupaka's berries are white when ripe, inkberry's are dark. Beach naupaka's berries, technically called drupes, are eaten by birds, who help disperse the seeds. Those seeds also float and remain viable for at least a year. They can be deposited along beach wrack lines, in mangroves and along inland shorelines. If they find a home in the dunes, they can displace vital and rare species like sea oats and sea lavender as well as inkberry. As we said earlier, this is a important plant in Hawaii and in other parts of its natural range. It is among the most widely used landscaping plants in the islands, as a hedge, border plant, wind break and more. Native Hawaiians would eat the fruit during journeys or in tmes of famine. It was used to treat wounds and skin diseases. Divers rub their facemasks with the flowers or fruit to prevent fogging. It's used in dye making. In other places, the greens are cooked for food, the wood to make pegs for boat building and the pith for making paper. And it is a plant of legends, the half-flower, the incarnation of the beautiful Hawaiian Princess Naupaka, unable to unite with her lover, Kaul. 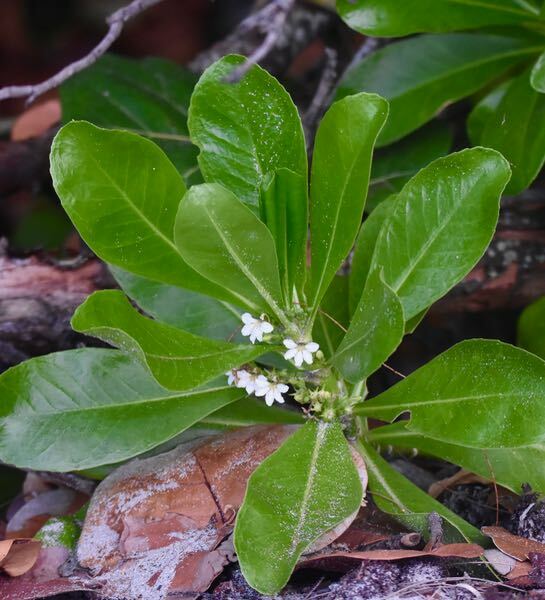 One quick note: there are actually two varieties of beach naupaka found in Florida, one called sericia, which has fine hairs on the leaves and stems, and toccada, which is smooth. It is a member of Goodeniaceae.